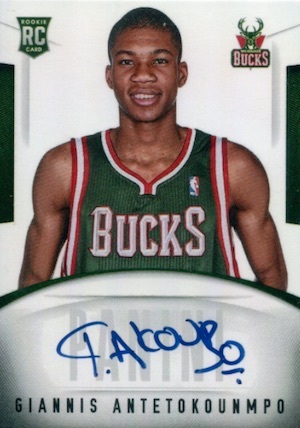 Much like his rapid growth spurt, Giannis Antetokounmpo rookie cards have soared to new heights in the hobby. Antetokounmpo, or the "Greek Freak," as many prefer to call him, may not seem like the likeliest superstar. However, the hybrid big man with point guard skills is poised to turn the NBA, and the collecting world, on its head. 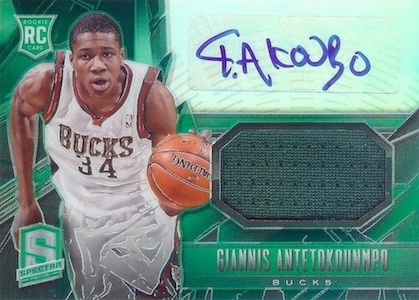 A native of Greece, Antetokounmpo was selected 15th overall in the 2013 NBA Draft, resulting in an influx of Giannis Antetokounmpo rookie cards. Mostly found in 2013-14 basketball products, there is also a notable 2012-13 release covered below. 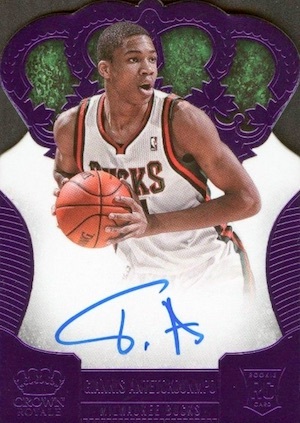 Focusing on the very best rookie cards for the Greek Freak, this ranked list analyzes the clear standouts among the first-year releases. 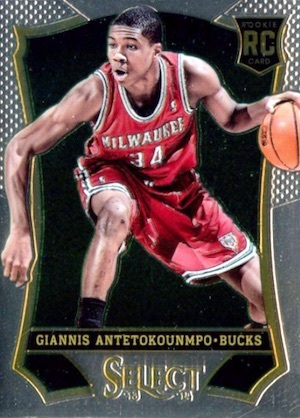 For more information, a detailed Giannis Antetokounmpo rookie card checklist is available, and you can also check out his most popular card auctions currently on eBay. Click on the listings to shop for singles on eBay. Linked sets go straight to product profiles. 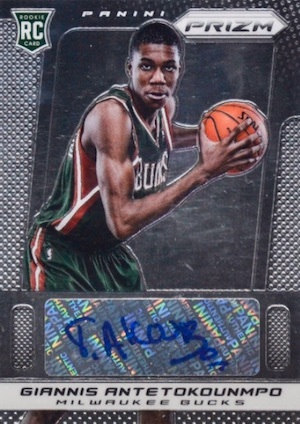 Not exceedingly rare, 2013-14 Select makes the cut because the base rookie for Antetokounmpo is distinct and offers several Prizm editions. The rainbow is not as large as other sets, but several options exists. There is also a rookie jersey autograph with a similar assortment of numbered parallels. 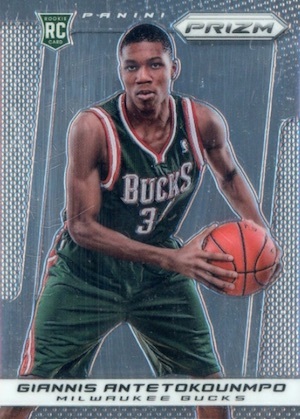 Although tied with Select on our list of the best Giannis Antetokounmpo rookie cards, the edge goes to 2013-14 Prizm. Prizm NBA is viewed on similar terms as Chrome MLB, and that makes it more popular in the hobby. This is also the place to find the most choices in the Prizm rainbow. Sporting a different image, the release offers a signed card with nearly the same design plus an added sticker autograph. 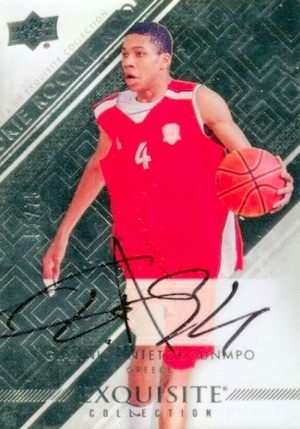 Appearing to be in the middle of a sprint up the court, the 2013-14 Spectra Giannis Antetokounmpo rookie card goes horizontal with a sticker signature and a jersey swatch. The base version is not numbered but there are Light Blue (#/99), Orange (#/60), Gold (#/10) and Black (1/1) versions. This is honestly a toss-up as either Spectra or Timeless Treasures could be eighth. 2013-14 Timeless Treasures gets the nod because it has a trapped acetate signature versus the standard sticker variety. The design is a little more muted, however, and the relic is smaller. There are also only three parallels, with Prime (#/49), Ruby (#/25), and the one-of-one Tag 1/1. 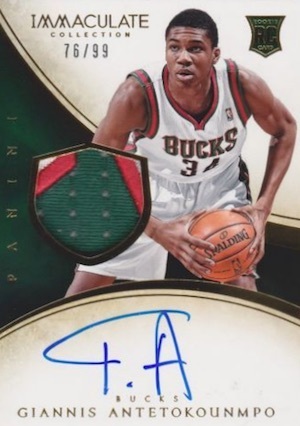 One of the better values early on in his career given the on-card signature and lack of numbering, prices have shot up for Antetokounmpo's 2013-14 Gold Standard rookie. In addition to the impressive design, the wide and thin jersey piece is unique. Parallels are simple here with only Platinum (#/10) and Black (1/1). 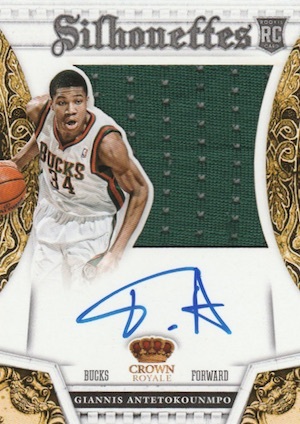 In my opinion, the main Giannis Antetokounmpo rookie cards in 2013-14 Court Kings are quite captivating. In addition to the base, there are actually three more versions in the main set, each with a different design and increasing rarity. However, I want to draw attention to the Next Day Autograph, which gets its name from the quick turnaround in production and signing. That is also the explanation for the generic design that does not seem to match the Court Kings style. Regardless of the simple look, these on-card autographs go for big bucks. More affordable are the hard-signed Fresh Paint cards, numbered to 499 copies. 2013-14 Preferred is an odd release that is comprised of only signed cards and booklet relics. 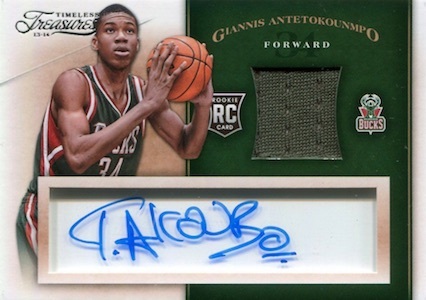 For fans of the Greek Freak, the key cards are found in the base autograph set. Although part of the larger Preferred lineup, there are three different on-card choices for Antetokounmpo under the Crown Royale brand. This includes the Panini's Choice pyramid die-cut, limited to 60 copies, Crown Royale die-cut with 49 copies, and Silhouettes autographed relic numbered to 99. There are also Gold (#/10), Green (#/5), Platinum (1/1) parallels for the die-cuts, and a Silhouettes Prime version, which has 25 copies. Once an NBA powerhouse, Upper Deck's Exquisite Collection used to be the high-end basketball set to collect. 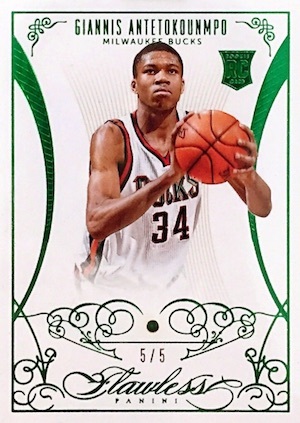 Working with a college theme after losing the NBA license to Panini, there are some notable Exquisite Giannis Antetokounmpo rookie cards out there, but they are in very low supply. 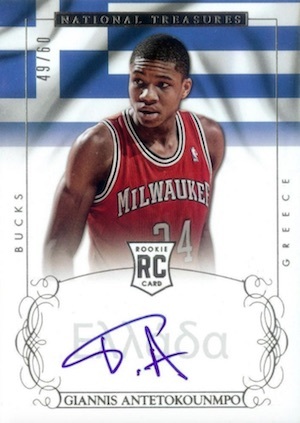 Centered around his Greece affiliation, the earliest Antetokounmpo card came in 2012-13 Exquisite as part of the 13-14 Rookie insert. 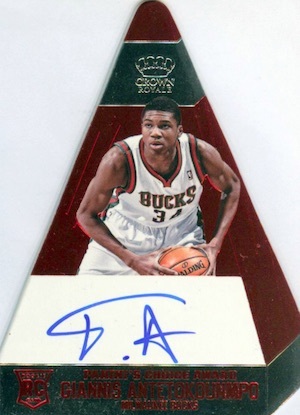 He also has low-numbered rookie autographs in 2013-14 Exquisite. 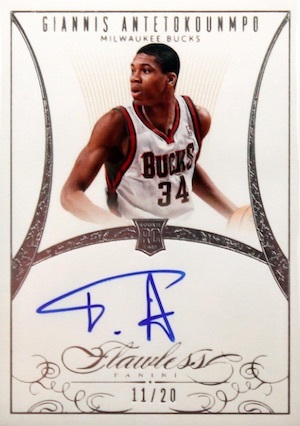 Offering the most limited choice, the 2013-14 Flawless Giannis Antetokounmpo rookie cards employ the signature Flawless style of real jewels embedded in the card. The base diamond version has just 20 copies, with additional Ruby (#/15), Sapphire (#/10), Emerald (#/5) and Platinum (1/1) options. He also has an on-card rookie autograph with the same parallels as the base gem. 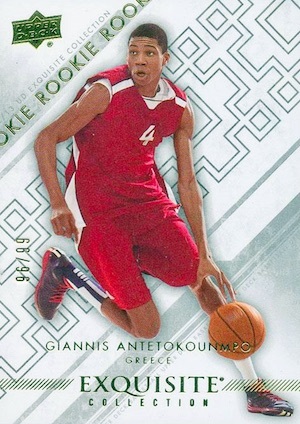 Moving to the truly elite rookies, 2013-14 Immaculate mixes brand power, an attractive design and limited availability. 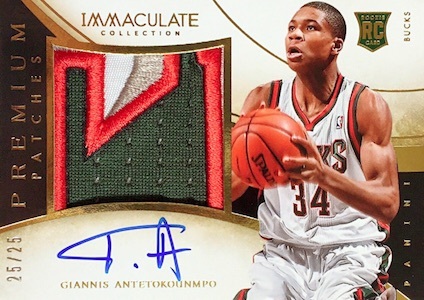 The RPA set offers just 99 copies for Antetokounmpo with both a small patch and on-card signature. The Jersey Number parallel is actually an acetate variation with 34 copies and a different player image. Also popular is the autographed Premium Patches card that is numbered to 25. 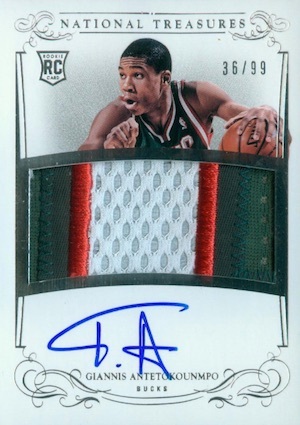 It's always hard to beat NT, and the 2013-14 National Treasures Giannis Antetokounmpo rookie card checks in at the top. While the large, centered patch does make for a weirdly-cropped image, it leaves more room for the signature. If you can even find one, expect to pay well into the thousands. 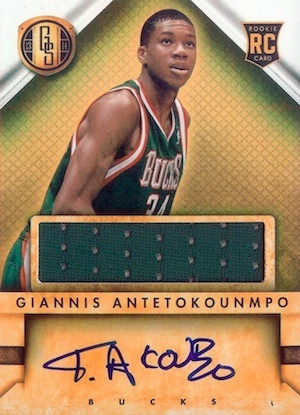 The horizontal version brings the print run down to just 10 copies, and Antetokounmpo also signed for International Treasures (#/60) and Kobe All-Rookie Selections (#/99). Both can be acquired for much less than the RPA. 2013-14 Giannis Antetokounmpo Totally Certified RC BGS 9. 2013 Panini Totally Certfied Giannis Antetokounmpo PSA 10 gem mint rookie MVP? 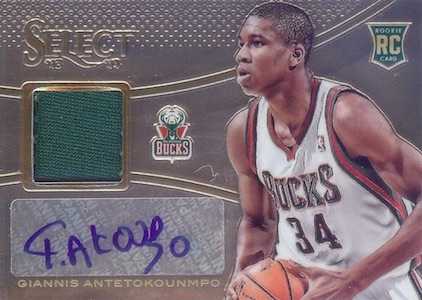 2013-14 PRIZM GIANNIS ANTETOKOUNMPO GREEN REFRACTOR RC PSA CROSSOVER 10?